This functionality is currently available only on Onshape's browser platform. This functionality is also available on iOS and Android in a limited form. Configurations are created only on a browser (in a Part Studio or an Assembly) but can be accessed and changed on mobile platforms, both iOS and Android. See Using configurations for more details. 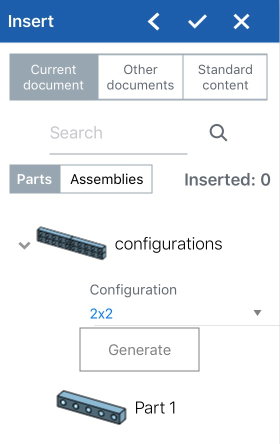 For information creating configurations in an Assembly, see Assembly Configurations. Create part families by creating variations of an entire Part Studio. You are able to configure any feature or parameter value and even part properties, custom part properties and sketch text. For example, you are able to configure the depth of an extrude feature, the application of a fillet feature, the faces selected for a fillet, the FeatureScript of a custom feature, and part numbers, colors, and materials. All of the features and parameters you configure in one Part Studio are referred to as a Configuration. Each Part Studio can have one Configuration. You are able to , however, create multiple Configuration inputs within one Configuration. This is especially helpful when the feature or parameter values you want to configure are not necessarily related to each other. For example, when the length and diameter of a part are not related to whether a fillet is applied, you can use two Configuration inputs. This allows more flexibility and can aid in keeping each Configuration input from becoming unnecessarily complicated. When more than one person is working in the same document, each sees their own selected configuration, except when working in Follow Mode; at that point the follower sees the configuration selected by the leader. 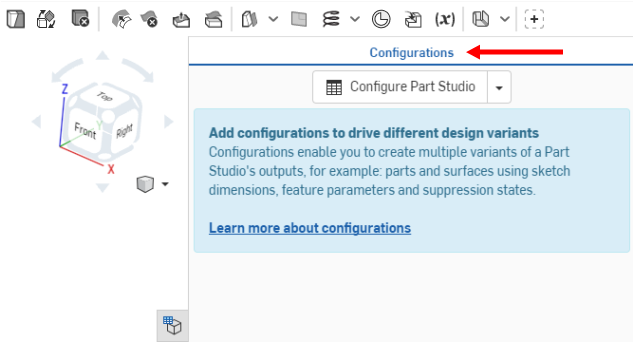 Below is an explanation of the basic steps for creating a Configuration with a single Configuration input in Onshape, and then an explanation of creating additional Configuration inputs in the same Part Studio. Lastly, there's an explanation of configuring part properties within any Configuration input. Click in the first row to activate it and enter the names of the input in the Name column. For example, to apply a flange to different sides of a sheet metal part, you might name the rows Top, Left, Right. Use Tab to move from one row to the next. The active row is indicated by a blue bar to the left of the row. To configure a parameter value for the indicated row, click . Open the feature that contains the parameter (click it in the Feature list) and select the parameter. The parameter is then outlined with a broken yellow line and a new column is created for that parameter in the table. The column name defaults to the Feature name (as a top-level heading) plus the field name (as the subordinate-level heading), in this case Flange 1 is the Feature name and Edges or side faces to flange is the field name. 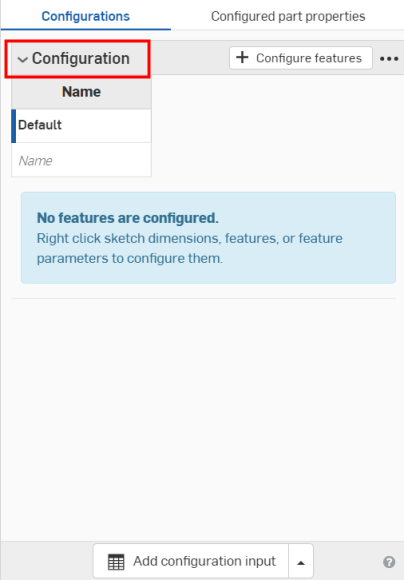 Hover over the fields in the feature dialog to see which parameters can be configured. Parameters available for configuration are highlighted in yellow when you hover over them. If the parameter is an entered value, click on the row in the table and enter a new value. If the parameter is a selection in a dialog, double-click the row in the table to open the feature dialog. For example: click 1 entity in the first row. The appropriate field in the feature dialog is highlighted in blue. 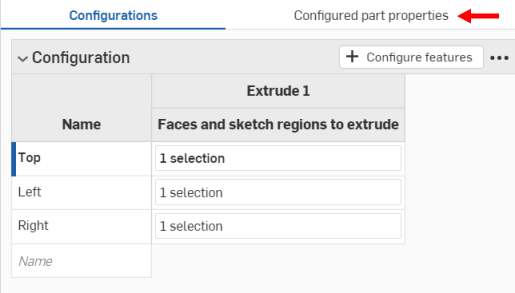 Make your selection on the model (or sketch) for this parameter. When finished defining the configurations, click the check mark on the Feature dialog to close it. Repeat step 6 through 8 for each row. Repeat steps 5 through 8 to add another feature parameter to the table. The model should update accordingly. If it doesn’t, check the model for design intent and the configurations definition for accurate selection. A Part Studio configuration can contain one or more configuration inputs. 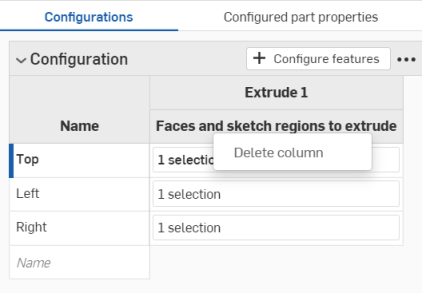 The steps above explain how to create a list type configuration input which results in a list of configuration choices when inserting a part into an Assembly or Drawing. You can create more than one of these configuration inputs (to keep one input from becoming too complicated or duplicating parameters) and also create different types of inputs. Other types of inputs you can configure are Configuration variable and Checkbox. Configuration variable - Creates a variable that can be used in any feature and in FeatureScript. Types of variables include: Length, Angle, Integer, Real, and Text. Enter the value of the variable at insertion time. Checkbox - Creates a check box to turn features on or off, like Fillets and Chamfers, and can also be used to suppress or unsuppress features. This type presents a check box to check/uncheck during insertion time. Once created, use the +Configure features button to select the associated feature/s. When created this way, a List input dialog is displayed. The name you give the configuration input becomes a variable in the system. This is different from the name when created using the basic steps above; that name is not a variable in the system. In the List input, enter a name for the configuration input. ‘Default’ is supplied as the first option name; you can click it to change it. Enter additional option names for the first column of the list table. Use the Tab key to add option names. To configure a parameter value for each option (the selected option is indicated by a vertical blue bar to the left of the name), click . To configure each instance of the parameter, double-click on the row in the table. For example: double-click 1 entity in the first row. When finished defining the configurations, click the check mark on the dialog to close it. Click the arrow to the right side of the button. Enter a name for the variable input (this becomes an actual variable in the system, referenced by using #<variable-name>). Select a type for the variable: Length, Angle, Integer, Real, Text. Text can be any type of text that can be used in custom FeatureScript. Enter values for the type of variable you selected. Click the check mark to save your definition. Double-click a feature in the Feature list to open it. Enter a name for the input. The configuration input has one column with an empty checkbox row and a checked checkbox row. To configure a parameter value, click . In this example, Unsuppressed is selected as a configuration parameter. Click to close the feature dialog. 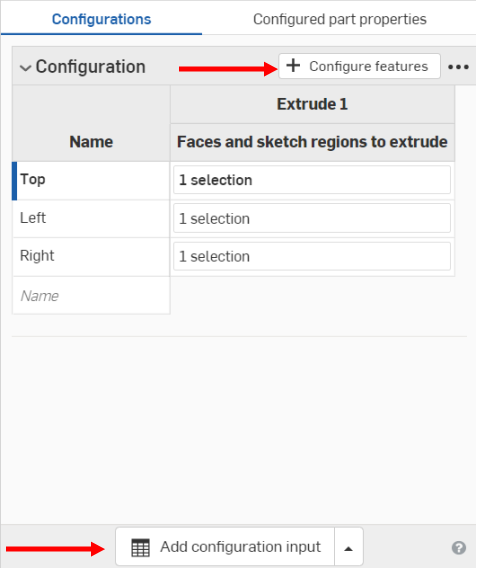 In the Configurations list, above the Feature list, this configuration input presents are a checkbox to turn the Fillet on (unsuppressed) or off (suppressed). Copy table - Copy the entire Input table, you can then paste the table into a spreadsheet for record-keeping or editing. You can likewise paste from a spreadsheet back into a configuration Input table. Rename - Select this action to open the dialog to rename the configuration input. 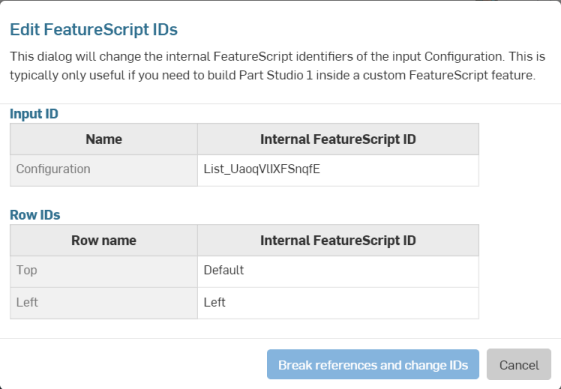 Edit FeatureScript IDs - This dialog will change the internal FeatureScript identifiers of the input Configuration. Click inside the dialog boxes to change IDs. When finished, select Break reference and change IDs in the lower right corner. This dialog is typically only useful if you need to build a Part Studio inside a custom FeatureScript feature. Delete - Select this action to immediately delete the configuration input; no warning is given. Switch to - When right-clicking a row that is not currently selected Input, you have the menu item prefaced with "Switch to" a different Input. 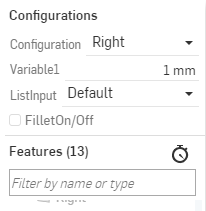 Set as default - When right-clicking a row that is not currently the default Input, select this to set it as the new default. Duplicate row - Create a duplicate row; this is especially convenient when preparing to paste a new table into this one. See Copying and pasting into and out of input tables below, for more information. Move up - Move the selected row up one level in the table. Move down - Move the selected row down one level in the table. Rename - Rename the Input. Delete row - Delete the selected row. You can click and drag individual column edges in the table to resize them; in the case of stacked column labels, click and drag the bottom label, indicated in the illustration above by the blue arrow. 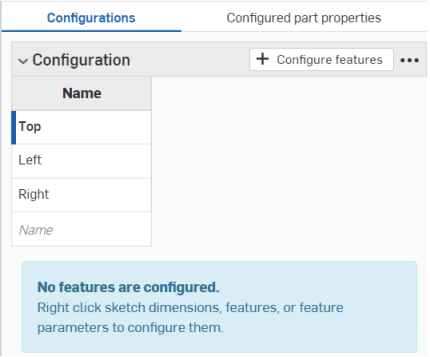 Onshape has a mechanism for also configuring part properties for each of the configuration inputs and options you have previously defined, directly from the Configuration panel. The properties available to be configured include: Part name, material, appearance, description, part number, vendor, project, product line, title 1, title 2 and title 3. If you have a professional or enterprise account, you can also configure custom properties. In the Configuration column, use the down arrow to select from the list of configuration options. In the Appearance column (part property), double-click to open a dialog from which to select the value (in this case, the Appearance editor). Click to close the property dialog and accept the value. To add more part properties for another configuration option, click . Select a new configuration option from the first column. In the Appearance column (part property), double-click to open the dialog from which to select the value. Select or specify the value and the table is populated with your choice. Repeat as necessary to configure the part properties for the necessary configuration options. 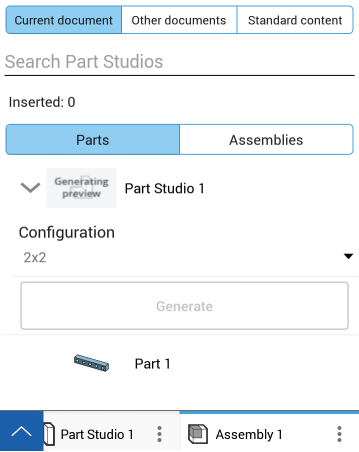 You are able to use the configuration inputs you create in the Part Studio to test the results and use that information to tweak design intent. 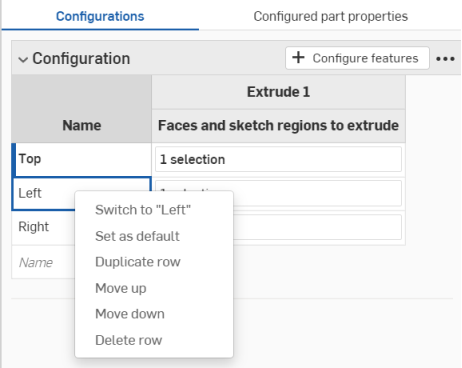 However, the main point of creating configuration inputs is to provide options for the parts you use during production workflows like creating Assemblies and Drawings. You can copy and paste into and out of a configuration input table, to aid in entering or editing input values. Open the menu in the upper right corner, next to +Configure features. 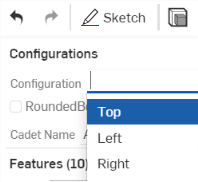 In the Onshape Configuration table, click the top, left cell of the table. 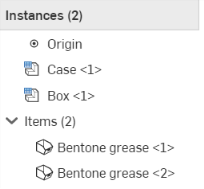 Onshape automatically replaces whatever data was in the rows and columns of the configuration input table with the data that was copied. 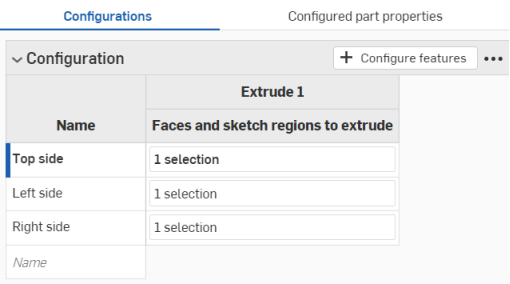 Onshape also includes the default units for each input parameter, automatically. 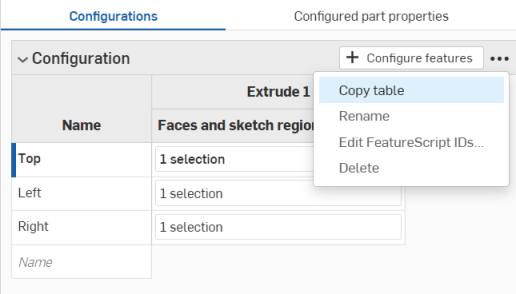 Note that if there are more rows or columns copied from the spreadsheet than are in the Onshape configuration input table, those rows or columns are not included in the paste. Onshape does not yet create the needed rows or columns on the fly. You can, however, use the Duplicate row command to create more rows if needed before pasting your data. You can also create additional columns (configured features) before pasting.